We know it can be hard to ignore treats like cookies, chips, and leftover holiday candy, but instead of giving in to a less-than-nutritious choice, why not look for a healthy alternative? Popcorn (if it’s not drenched in butter) can be a good snack option. A whole grain, popcorn contains 3.5 grams of fiber per 3-cup serving. We know it can be hard to ignore treats like cookies, chips, and leftover holiday candy, but instead of giving in to a less-than-nutritious choice, why not look for a healthy alternative? Popcorn (if it’s not drenched in butter) can be a good snack option. A whole grain, popcorn contains 3.5 grams of fiber per 3-cup serving. But how do you know if you are chowing down on a relatively healthy bag of kernels? 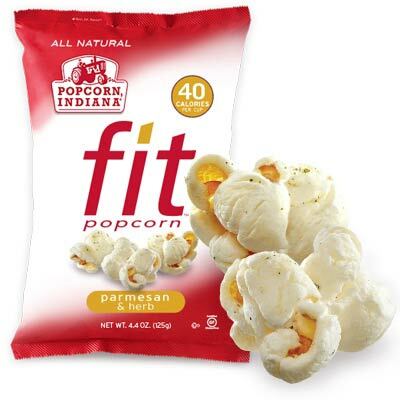 One good option is Popcorn Indiana’s new Fit popcorn line. The popcorn comes in four different flavors including sea salt, Parmesan and herb, onion Dijon, and extra virgin olive oil. All four flavors are about 130 calories per 3.5-cup serving and contain zero trans fat. And yes, it still tastes good! Our favorite was the Parmesan and herb. If you're watching your sodium, your best bet is the extra virgin olive oil variety, which contains 210 mg of sodium per serving (Parmesan and herb has the most, at 250 mg per serving). You can buy Fit popcorn in bulk at Popcorn Indiana's website or check Whole Foods, Target, or drug stores like Duane Reade or CVS for individual bags.